Carina McKay is an outsider. With one parent of royal blood, she’s not nobility, yet not a servant either. Critons, magical fire‐breathing creatures that protect her homeland, provide the only excitement in her routine life until she meets King Marek Duncan and her destiny changes forever. 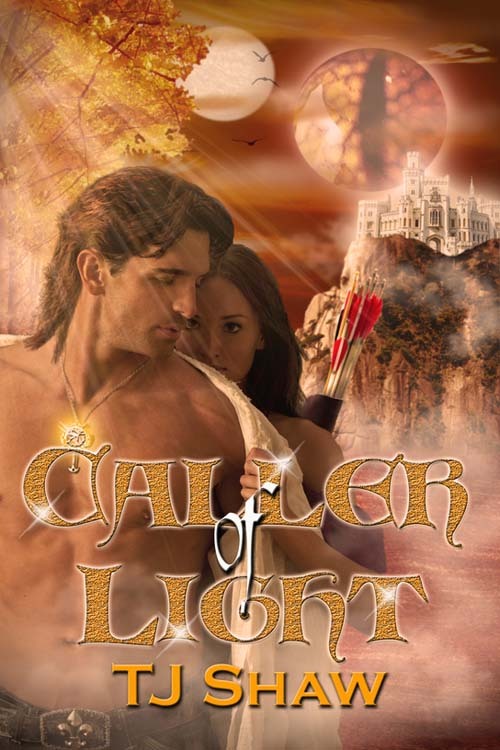 To protect his heart after an arranged marriage withers to a bitter end, Marek focuses his energy on defending his lands from a rising darkness by searching for the Caller of Light, the one who summons Critons. Marek spots Carina while traveling to a distant kingdom. Despite himself, her beauty and willfulness intrigue him, and he ultimately discovers just how much he will endure to safeguard her from the lords who want to enslave her. Together, the strength of their love can overcome the obstacles keeping them apart, but only if they have the courage to follow their hearts. He was about to inquire into Carina’s whereabouts when she emerged at the top of the stairs. She paused. Uncertainty flickered across her face. For a moment he thought she was going to fade back into the shadows of the upper floors. But she took a deep breath, squared her shoulders, and stepped off the landing. He inhaled a ragged breath at the sight of her. Her dress accentuated the slight swing of her hips while the tight bodice molded perfectly to the swell of her breasts. With each step as she descended, a slow burn heated his blood, flooding hot desire straight to his groin. She shimmered in the soft light spilling from the room—a light acting as a path for her to follow, illuminating her way…to him. He extended his hand and tried to keep his fingers from twitching in anticipation of her touch. She hesitated, and had yet to look him in the eyes. But she could not deny him, not without causing insult, so he waited. His body trembled when her hand slipped into his. For the second time today, he couldn’t let her go. She had entered the room on a whisper, but swept across his senses like a winter storm. She was the calm, silent stillness just before the skies unleashed their wrath to prove yet again the power of the Mother Source. The sweet anticipation of thunder crackling through the air slammed through his defenses, yet her tranquil demeanor kept the sizzling turmoil at bay. Her hair was arranged in elaborate curls and braids that exposed the delicious contour of her neck. As she continued to look down, her dark eyelashes contrasted against her pale skin. He resisted the urge to brush his thumb across the soft curve of her lips. She was a feast for his eyes to devour. He wanted to tell her that she looked stunning, but his voice failed him and he could only mutter her name in a gravelly, scrape of sound. She lifted her chin and peered at him. He saw something within her troubled eyes. Confusion? Pain? Had he caused this? Guilt plagued his mind. He should’ve told her his true identity when he first saw her boldly petting FireStrike. But after he’d accidentally insulted her and she had stood defiant in front of him with her feet planted and hands fisted, her willfulness had struck him like a fire bolt. Her enthusiasm and spirit was a refreshing surprise that threw him off guard. His desire to maintain that brief illusion so he could enjoy her unshielded companionship had hurt her, and he was paying a heavy price for his omission. Somehow, both of his hands now sandwiched her smaller hand in a possessive hold while he struggled to control his beating heart. He could only stare at her, his eyes focused on the incredible woman in front of him. But like an oozing wound, Marissa’s perfumed scent invaded his senses just before her fingers settled in the nook of his arm, claiming him.